A pair of Spitfires of No. 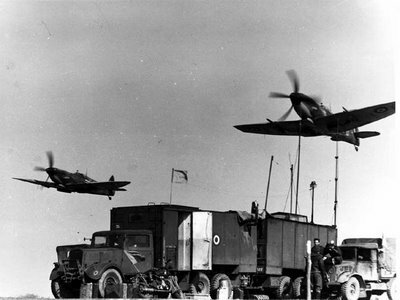 443 Squadron, 127 Wing RCAF, beat up the airfield over the squadron’s flying control unit at Petit Brogel, Belgium, March 1945. The aircraft nearest to the camera is a clipped-wing Spitfire Mk. XVIe coded 2I-D serial no. 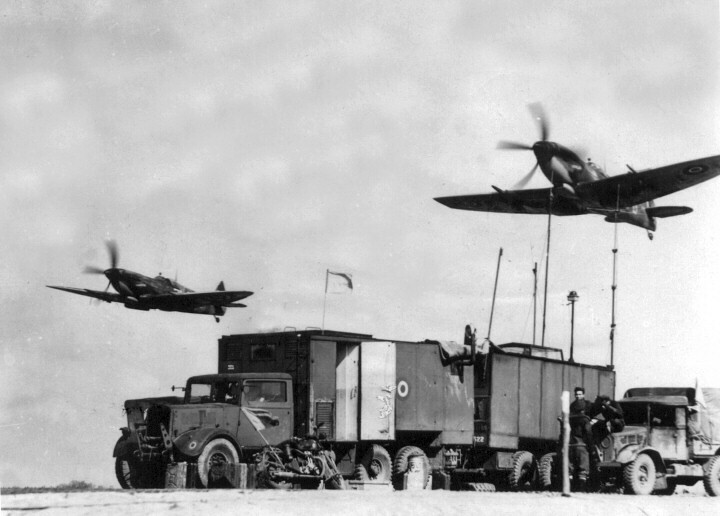 TB476, piloted by the unit’s CO, Sqn/Ldr Art Sager. His aircraft wore the name “LADYKILLER” painted on the cowling. Hi: My name is Nicole Morley and my Great Uncle Arthur James Horrell was in squadron 443. I think it’s great that you have a picture of spitfires that belonged to squadron 443 back then.I’m doing some research on my Uncle and it’s always nice when I come across a picture or some bit of information about the squadron he use to belong to. I knew Art Sager during the Y2-K Spitfire Restoration Project, and used to take him up for the annual fund raising event in Comox. I also introduced him to the current 443 RCAF Helicopter Squadron gang, which he enjoyed very much. He was a fine man. I am familiar with his Mk XVIe aircraft pictured here, but was wondering about info regarding the other aircraft in the photo. Do we have any info as to the serial and codes? There also appears to be an inscription on the cowling, and idea what it might have been? I asked Art one day if he remembered the other aircraft flying with him that day, and he couldn’t recall.